The incredible Playing For Change band and Bogner Amps joined forces for their show at the iconic Whiskey-A-G-Go on the Sunset strip in Hollywood, CA. Performances by bluesman Keb Mo and The Doors drummer John Densmore rounded out the night. A little trivia - The Doors were the house band at the Whiskey-A-Go-Go in the mid-1960's. The Playing For Change Foundation and it's 11-piece touring band believe in creating positive change through music and arts education (more info on the PFC website here) Their efforts and music programs have helped hundreds of children, many from impoverished and war torn countries, gain access to musical instruments and arts education. Check out their videos, like this one here, that feature musicians from all around the world coming together for a common cause of bringing joy and hope through music. Music truly transcends language, race, culture and religion. It can bring us all closer, through it's groove and emotion, all without saying a word. The Whiskey shows entire back line featured Bogner Shivas, Metropolis and Duende amps being played by Louis Mhlanga, Vasti Jackson and Robin Moxey. You'll remember Robin from the Bogner Lafayette video found here. The PFC band features incredibly talented musicians from all around the world and their message is clear - bring peace, respect and understanding through music. And Bogner Amplification is proud to be part of this message and PFC! Coming soon will be a Bogner video of this performance but until then enjoy some photos of the rehearsal, souncheck and performance by our Creative Director Greg V. (more pics available here) Enjoy! New video from Breaking Arrows featuring guitarist Daita Ito with his Bogner Ecstasy and 4x12 cabinet. Daita was an original member of the massively successful Japanese rock band Siam Shade. His new band Breaking Arrows have just released their debut album and features the first single and video "Tears Falling Heavy" More Breaking Arrows info here. Check out the new video from Drown Incus for their song Narrow Path. Hailing from Lucerne, Switzerland Drown Incus is an alternative metal band. Andy, the guitarist, uses a Bogner Uberschall amplifier. Find out more about the band here. Guitarist Rafael Moreira and Bogner ROCK 65,000! Guitarist Rafael Moreira and Bogner rocks 65,000 during the opening Copa Libertadores Cup Final 2013 between Atletico Mineiro vs Olympia. Two Bogner 4x12 cabinets: check. 400 million viewers world wide: check. Hand Wired! Here's a cool in-camera double exposure shot of Reinhold Bogner captured by our Creative Director Greg V.
Tool drummer Danny Carey and guitarist John Ziegler of Volto release new record. 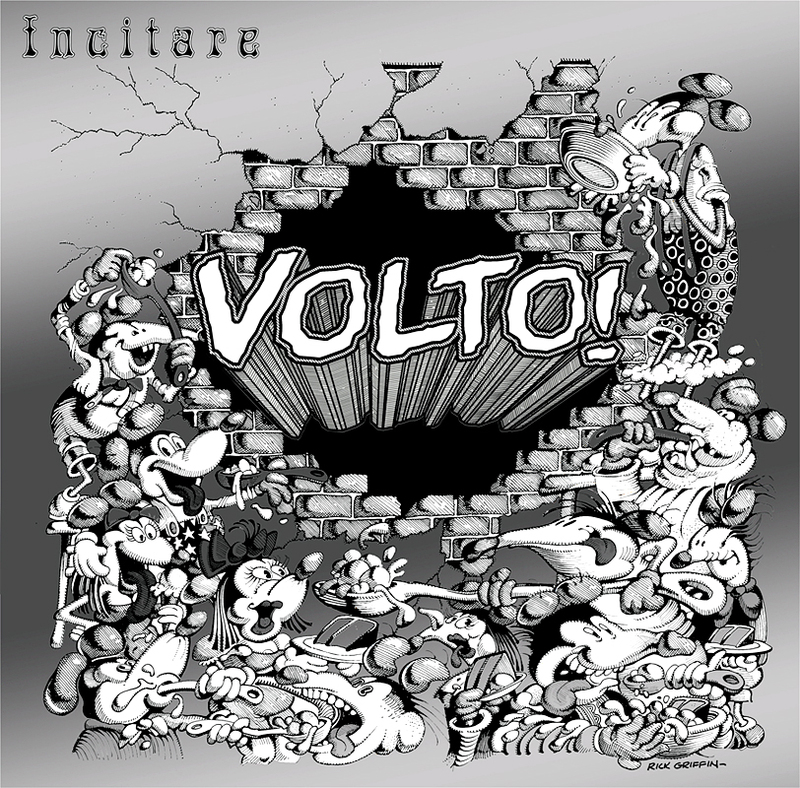 'Incitare' is the the debut release from Volto the Los Angeles based jam-fusion project featuring Tool drummer Danny Carey, guitarist John Ziegler and bassist Lance Morrison. Born from their mutual love of 70's fusion as well as classic and modern progressive music, Volto evolved from a fun side project to it's own musical identity. Guitarist John Ziegler used his Bogner Uberschall throughout the record and will use his Bogner Ecstasy amp for the upcoming tour. Concert dates are being added including a show with YES at Yestival in Camden, New Jersey. See Volto's website for tour dates and more info here. Singer-songwriter and guitarist Robin Moxey takes our Lafayette amp back in time. To a time that merges peace, love and non-master volume amps. So kick back and ride a musical journey of past and future where our 12 watt EL84 Lafayette blends together pure classic American tweed tones with British EL84 chime. Check out Robin on Facebook here. Dig it! Bogner Ecstasy and Goldfinger amps in the studio with ESP artists Prashant Aswani and Andy James. It's a merging of their shred and heavy American and British musical styles that comes together while tracking The Last Train song which is available here on CdBaby. Toto's Steve Lukather Ecstasy video! Cinderella's Tom Keifer with guitarist Tony Higbee on tour! New Justin Derrico Rig videos Part 1 and 2 ! Check out the new video of guitarist Sean Hurwitz playing a Bogner Ecstasy amp and 4x12 cabinet for a performance with Smash Mouth "Walking On The Sun" high up in the Hollywood Hills for VH1. Bogner announces four new Transformer loaded pedals. Bogner Amplification debuts a new line of groundbreaking pedals. Reinhold's innovative design places an audio transformer at the heart of the circuitry in these pedals. The custom transformer adds a stunning, three dimensional quality, similarly found in Bogner's tube amplifiers and in legendary British mixing consoles of the 1960's. The result is a harmonically rich, buttery tone and feel which is nothing short of a sonic symphony. Click the picture below for a larger view. Check out the May 2013 Guitar Player and Electronic Musician magazine articles featuring Jerry Cantrell on the cover. He discusses the new AIC release and using his Bogner Fish preamp and Uberschall amp in the studio. New Mephisto demo video with a surreal twist! Here's Bogner's newest video for our Mephisto amp which features two iconic vintage style amps in one chassis, one is an EL84 and the other a 6V6. It's parallel amp switching that allows you access to each amp separately or combine them for even more sonic shape shifting possibilities. 18 watts of power and available as head or Celestion loaded 1x12" combo. Take a magical and surreal journey with the Mephisto! Atma amp on the cover of Premier Guitar! The Bogner Atma amp is featured on the April cover of Premier Guitar magazine and in their new article "Wham, Bam, Thank You, NAMM!" which you can check out here.